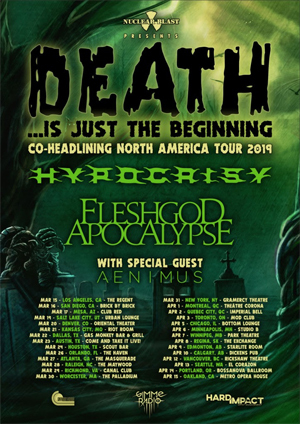 The currently running Death…Is Just The Beginning Tour, featuring double headliners FLESHGOD APOCALYPSE and HYPOCRISY is the must see death metal tour of the spring! Both bands bring their unique styles of Symphonic and Melodic death metal to sold out crowds! Don’t miss it!